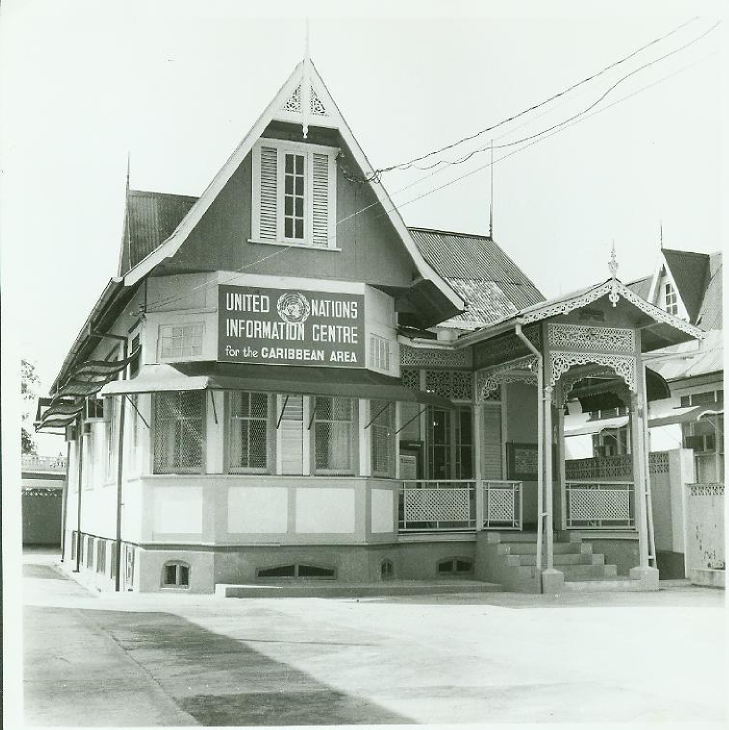 The United Nations Information Centre for the Caribbean area (UNIC) opened its doors in Port of Spain on 18 January 1962, just a few months before the official independence of Jamaica and Trinidad & Tobago. It was one of the first official United Nations offices in the Region. UNIC is part of the Department of Global Communications, which was established by General Assembly Doc - Resolution 13(i) on it's very first session as the Department of Public Information. It was charged with the responsibility of telling the story of the United Nations to the World. Today the UNIC in Port of Spain is part of a global network of 63 UN Information Centres around the World which operate in over 100 different languages. Our mandate includes advocacy, outreach education and engaging in partnerships with different actors in society at different levels. The underpinnings of our work are Human Rights, Development/SDGs, Climate Change, Peace and Security. The Budget of the Centre is determined by the annual work programme set out from the guidelines of the Committee on Information (COI) which deliberates annually on those priority issues that should be communicated. Funds are approved and assigned from the Department of Global Communications out of the Secretariat's regular schedule. We cover the English and Dutch speaking Caribbean, which translates to 19 countries and territories that are spread over a geographic area of approximately 2.4 million square kilometers. Out Outreach is from Suriname to the south, The Bahamas to the north and Belize to the west. We are located on 2nd floor Bretton Hall , 16 Victoria Avenue, Port of Spain, Trinidad. please let us know ahead of time if your group want to visit us, so that we may make the appropriate arrangements to welcome you. * For your security - visitors are asked to deposit bags and parcels at our security check point. Items permitted include - phones and other devices; small handbags; notebooks and personal items. The UNIC promotes United Nations issues that the Secretary-General feels should have a priority. The aim of this is to encourage support from governments, organisations, community groups and the general public with the ultimate goal of realising the universal access to rights, freedoms and a better quality of life for everyone. An important part of the work of the UNIC is to reach out to different audiences and partners in the Caribbean. The Centre hosts and participates in events and activities as part of its programme to promote the United Nations and to encourage support for the Organisation and it's work in the region. Some of them include annual observances like the Trans-Atlantic Slave Trade and Holocaust Exhibits; Joint United Nations Day observances with other UN offices and sharing special displays with partner organisations. One of the ways that UNIC is able to reach out to people across the region is by exploring opportunities for partnerships. Our partner organisations and groups play an important part in helping us to tell the story of the United Nations, promote and advocate for those priority issues on the Secretary-General's agenda. Our partners include, educational institutions, non-governmental organisations, libraries, diplomatic missions and other UN offices and agencies. Partners sometimes make funding available for UN themed events or sponsor campaign activities, because it is part of their agenda as well - for example Human Rights education or Model United Nations. Mutual Benefits - by working with the United Nations Information Centre partners support the work of the Centre but also benefit from a working relationship with us- In addition to being exposed to useful information, learning tools and resources they can become associated with United Nations Department of Global Communications and continue to build a good name for themselves while gaining access to and participating in meetings and events at the regional and global level. UNIC also facilitates partnerships between partners across Trinidad and Tobago and the wider Caribbean.